FILE - Jubaland forces walk near the site of an Aug. 22, car bomb attack near a military training base south of Mogadishu. The growing trend of terrorism and extremism in Africa has many powerful forces behind it, said analyst Jakkie Cilliers, who leads the Institute for Security Studies think tank. But, he said, the most powerful driver of international terrorism is a controversial one. It’s America. “Deliberate or not, the main drivers of international terrorism today is the policies and actions of the United States and its Western allies,” he said this week during a briefing in Pretoria, South Africa’s capital. That’s the confrontational conclusion of Cilliers’ new research into the well-documented rise of terror groups in Africa in the past decade. It also, he noted, could serve as a timely warning as the US this week deployed 300 troops to the West African nation of Cameroon to join the fight against Boko Haram militants. But, he said, African governments are also to blame. 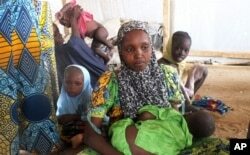 Boko Haram, after all, started in northern Nigeria and was initially spurred by grueling poverty, inequality and poor governance in the area. Somalia’s al-Shabab group started in 2006 as a local political army before rising to the East African terror juggernaut it is today. And, said Cilliers, the world’s most famous terror group, al-Qaida, also had local origins. 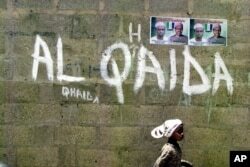 FILE - A girl walks past a wall with graffiti about the al-Qaida network in the northern city of Kano, Nigeria. What advice does this leave for African governments who are struggling to fend off extremists? The main solution, Cilliers said, is both simple-sounding and incredibly difficult to pull off: clean up the government, increase employment opportunities, improve education and social services, and make life better for all.